You are here:Home>Car Accident Lawyer>How to Select a Car Accident Lawyer? Do you prefer to work with a solo practitioner who maintains a small caseload? Or would you rather take advantage of the resources available through a larger firm? Large or small law firms are not inherently superior to one another; they simply suit different clients. Some car accident law firms focus exclusively on personal injury, or sometimes, a very specific aspect of personal injury law. Other firms take on a wider range of legal matters, such as business formation, family law, or criminal defense. There are unique benefits to working with both types of practices. Specialty lawyers may boast the most experience with cases similar to your own. However, in some circumstances, it behooves you to work with an attorney with broader experience-especially if your case involves the overlap of multiple practice areas. Your attorney’s track record will tell you a lot about whether he or she is worth your time. Some lawyers highlight their case history on their website; with others, you’ll need to do your research. In addition to studying past cases, examine Avvo, Yelp, or other sites for detailed reviews from satisfied and dissatisfied clients. Word of mouth can also prove valuable; ask loved ones who have suffered similar ordeals for feedback about their legal team and the opposing counsel. A little due diligence can prompt huge dividends. Seek an attorney with a strong track record and a demeanor that makes you feel comfortable. Struggling to choose a Texas personal injury attorney or McKinney car accident lawyer? 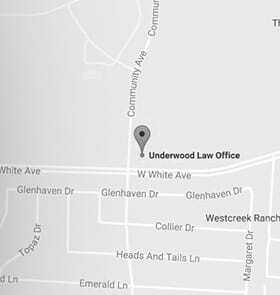 Your case will lie in capable hands if you work with Underwood Law Office. Call 972-535-6377 today to schedule a case consultation and to see if we’re the right fit.